A lot of you asked about the natural thyroid medication that I’m on, so here’s how I’m feeling! 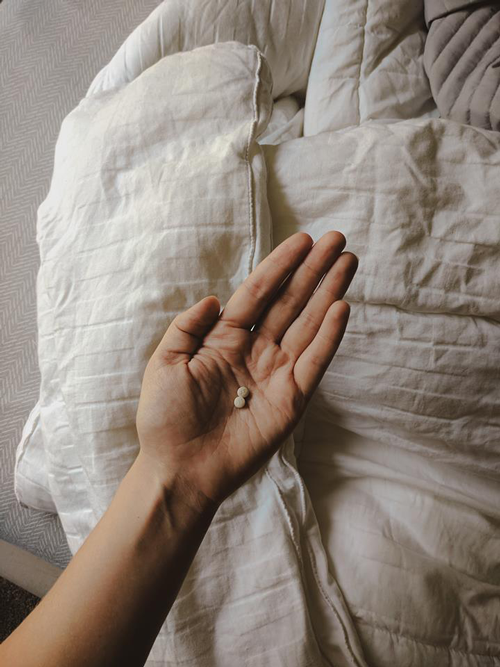 I don’t like the idea of taking a pill every day to function normally, that just doesn’t seem natural to me.. but at about 6 months postpartum last time, I went hyper, this time.. my thyroid is showing hypo which is the opposite of what I was experiencing last time, when I was diagnosed with Graves’ Disease. This time, my TSH is 45.77 which is clearly hypo to put it simply. This time my doctor put me on a natural thyroid prescription of desiccated thyroid. None of this should be construed as medical advice – that’s not what I’m trying to do here, I’m just letting you know that I’m taking the natural approach, how I’m doing it and what I’m feeling. I am not a doctor, nor do I work in the medical field and I have not had any proper medical training or schooling. This is me speaking from personal experience, not to be confused with professional experience. Classified by many online, NP Thyroid is an excellent brand of desiccated porcine (pig) thyroid. Me, I don’t eat any pork, bacon or ham. So, finding out that this was from pigs took some time to wrap my brain around. In addition to pig thyroid, this medication also has 38 mcg levothyroxine (T4) and 9 mcg liothyronine (T3) per one grain (60 mg), though like all desiccated thyroid, has all five hormones. This medication can be taken by mouth or sublingual – under the tongue. On the paperwork from my pharmacy, it simply says: “1x Per Day” and that’s it. I found that to be very vague and to be sure that I was taking this medication correctly, to gain the full effect – I read more about it online. I was originally prescribed “Nature Thyroid” this is the generic of that medication, so I started with the manufacturer’s websites and then headed to forums. What I found is that with these products, you’re supposed to take them 1 hour before or 2 hours after eating, you’re also supposed to cut out dairy because it can limit the effectiveness of the pill. It is also helpful to take NP Thyroid at the same time each day. In addition to NP Thyroid, my daily supplement and vitamin intake consists of a few different things to help with immune support and to regulate the thyroid. I started taking NP Thyroid 9 days ago and since I started my daily doses I have noticed that my energy levels have been fully restored (YES!!!! I was in bed for 15+ hours per day and just couldn’t kick the sleepiness!) I have also lost 5lbs! Prior to taking this medication, I was unable to shed any baby weight after the initial drop from giving birth to the twins. It sent me into a depression because I was working out 6 days per week anywhere between 30 minutes and 1 hour per day. I was primarily doing HIIT with a combination of yoga, running and strength training. In addition to exercising, I maintained a clean diet that was primarily plant-based. As of 2 weeks ago, I have not been exercising because on my CBC, it showed a level of 80,000 platelets which is considered out of range and low, a repeat CBC showed a platelet level of 63,000. Low platelets can be dangerous or fatal if an injury occurs, so I’ve stopped all strenuous physical activity or outdoor play since an accident can occur at any time. I also would like to add that when I saw my doctor about my hypothyroid lab results, they told me that it was imperative that I took on a gluten free diet. I haven’t looked much into this, but instead – I decided to just cut gluten out of my diet completely. This could also be what is helping with the weight loss, but either way – what I’m doing now is making positive body moves which makes me feel so much better. I’m so thrilled to see the scale moving in the right direction, I am also happy to have my energy levels back in place. I can only hope that it is from my thyroid levels regulating. I won’t know the true effectiveness of this medication until I have another thyroid panel done, the doctor is recommending that I take another blood test in 6 weeks — but I think I’ll do one at 4 weeks just to see if there has been any change.. because I’m impatient pretty much haha. I have found that a lot of doctors are resistant to prescribing natural thyroid medications because the natural options include T3 and T4, which can lead to hyperactivity with the thyroid gland. This to me, seems like it’s telling me that the natural option seems to be more effective but you will need to adjust your dosage more often to find the correct dose for your individual needs. If your doctor isn’t willing to help you with that – go get yourself one that will. Seek better medical care because there is nothing more important than your health. Unfortunately, some insurance plans won’t cover a visit with a functional medicine doctor or a naturopath, and that’s okay – save the money and go see one on your own I promise 100% that you will have a much better visit because these people are wired to find the root cause of your disorder, not to band-aid your symptoms. When I was first diagnosed with thyroid problems, my doctor said “I can refer you to an endo specialist, but they are probably going to suggest that you have your thyroid removed or destroyed – that’s not what I would recommend at this point” and at first because I was seeing a PA, he wasn’t sure if we could beat the hyperactivity, but I asked him to stay on as my doctor and sure enough, we beat it and although thyroid issues can directly affect fertility.. we got my butterfly working in a way that landed me identical twins naturally. So I personally don’t believe that having the thyroid removed is the first option, I believe that the natural approach is alway safer, however – you can over-do the natural approach and end up like me with levels behaving badly in the oppsite direction, but here is where patience comes in. Here is where you’ll need to then research again, and adjust your doses. I’m glad you’re here, and I’m glad you’re coming along with me on this journey. If you have any questions or suggestions for me, please don’t hesitate to send them my way. Last but not least, if you’re still taking routine immunizations and boosters – stop! That is a direct trigger for thyroid malfunction which as been proven time and time again in studies.